Level varies depending on level of person that hailed Gemmi. This page last modified 2007-12-21 10:18:23. He is lvl 80 when being spawned by a lvl 105 character. This might be his maximum level. Spawned him with my 83 monk. Anguish/SoD group geared, 500+ AAs. Easy fight. Hit me 13 times during the whole fight. Landed one for just over 1000, but average hit was 300-500. In addition to the loot from the listed table above, he dropped Rune Binding Powder for me. He was dark blue to me so definitely higher than 70.
hits for 150 to 800 max for lvl 77 char. He definitely scales with the level of the toon that spawns him. I suspect 70 is highest, anyway, tho. My lvl 77 .. he was lt blue (suspect 70). My lvl 65 .. he was even con. My lvl 55 .. he was even con. My wife's lvl 76 .. he was lt blue. Suspect he's 55, 60, 65, 70... not sure how low but wouldn't be surprised if as low as 25 given the guardians static spawn. Also, got an uncut rubellite on the lvl 77 kill. it cons equal to the person who cons gemmi so have a lowbe hail gemmi and then hel be a low lvl mob if you hail gimmi at lvl 70 he wil be 70 min lvl 55 max lvl 70. 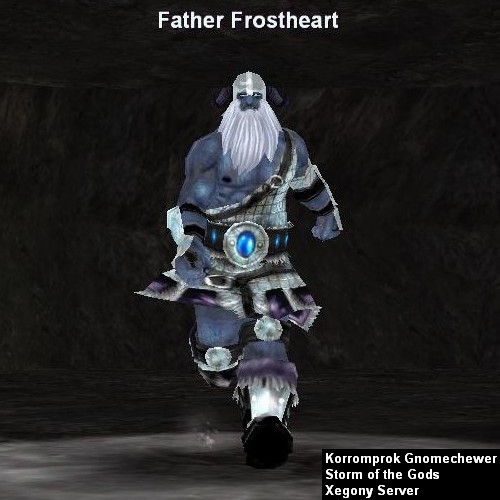 Father Frostheart was white to me (lvl 60) as you can see in the screenshot, but his level may depend on the level of the player spawning him.